The Star-Spangled Banner is the current national anthem of the United States of America. 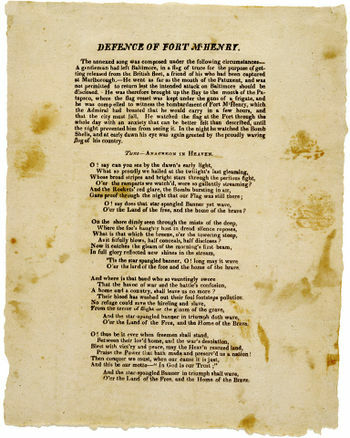 The poem (lyrics) was written by Francis Scott Key. On 13 September 1814, during the War of 1812, Key visited the British fleet in Chesapeake Bay to negotiate the release of Dr. William Beanes, who had been captured after the burning of Washington DC. The release was completed, but Key remained with the British overnight during the shelling of Fort McHenry, one of the forts defending Baltimore. In the morning, Key saw through clearing smoke an American flag still flying after the 25 hour bombardment of Fort McHenry. He wrote a poem to commemorate the occasion, noting that it should be sung to the popular British melody "To Anacreon in Heaven." In 1916, President Woodrow Wilson ordered that it be played at military and naval occasions, and in 1931 the Star-Spangled Banner became the national anthem. Francis Scott Key visited the British fleet in Chesapeake Bay during the War of 1812. His purpose was to obtain the release of Dr. William Beanes, whom the British had captured after invading and burning Washington, D.C..
Key was successful in his mission, but was held anyway by the British overnight during the British shelling of Fort McHenry, which defended Baltimore. The British bombardment of the fort lasted a merciless 25 hours. The following morning, Key was thrilled to see a gargantuan American flag still flying despite the bombs, and he composed a poem in honor of that endurance. He did not compose the music, which is not an original score. Instead, he simply suggested that his poem be sung to the familiar British tune, "To Anacreon in Heaven." In 1916, President Woodrow Wilson ordered that it be played at military and naval occasions, and in 1931 it became the official anthem. Until the official adoption of the The Star-Spangled Banner, My Country, 'Tis of Thee was a de facto National Anthem. In the aftermath of the 9/11 terror attacks, many American tourists were stranded in Britain. The "Changing of the Guard" ceremony at Buckingham Palace is usually watched by several hundred onlookers, mostly tourists, who line the pavement in front of the palace to see the centuries-old tradition, which dates back to 1660. On 13 September 2001, a crowd of around 5000 people, mostly Americans, had gathered in the absence of few other focal points in the capital for the American community. In an unprecedented move, the Queen ordered the band of the Coldstream Guards to break over three centuries of tradition and to play the Star Spangled Banner as a sign of respect and solidarity. ↑ Kelso, Paul US anthem played at changing of the guard The Guardian, 14 September 2001. Accessed 14 February 2008. This page was last modified on 16 April 2019, at 21:56.